It has been a little while since the first testing. Adrian has been to the factory in Slovakia and since then the weather has been unobliging. In the mean time we have fitted the optional oil cooler flap - very worthwhile. Finally, circumstances have stopped conspiring against us and Adrian is returning to continue testing. He flies his Alpi into Popham and I drive him to our Airfield. After a checkover, he flies our baby back to Popham. On the way, he does the rear CofG tests. Weights are placed at the very rear of the luggage area for the maximum luggage weight. Only minimal fuel is in the tanks and a single pilot to keep the mass down and hence the most rearward CofG. He completes the tests which gives us time to arrive at Popham by road at the same time. It's George's turn to be observer for the next round of tests. He gets strapped in and has the same huge grin that I'm sure I had last time. These tests are to be completed with a fully forward CofG so pilot and passenger and enough fuel to make it up to 450kg. The tests involve checking stability at both ends of the speed spectrum. So diving to Vne and inducing stalls - George needed to have a strong stomach. Also timed assent and descent. All went well. .
All done, we go over the road to the Little Chef for some lunch. However, during our refreshments, we are going over the requirements and paperwork and realise that we haven't done the transponder test. After lunch, it's Ian's turn to go up, to do the transponder test, which doesn't take too long. This leave time for Ian to enjoy a bit of flying the fruits of his labours (and investment). Fantastic! We have all had a go (except Tom who is still out of the country). 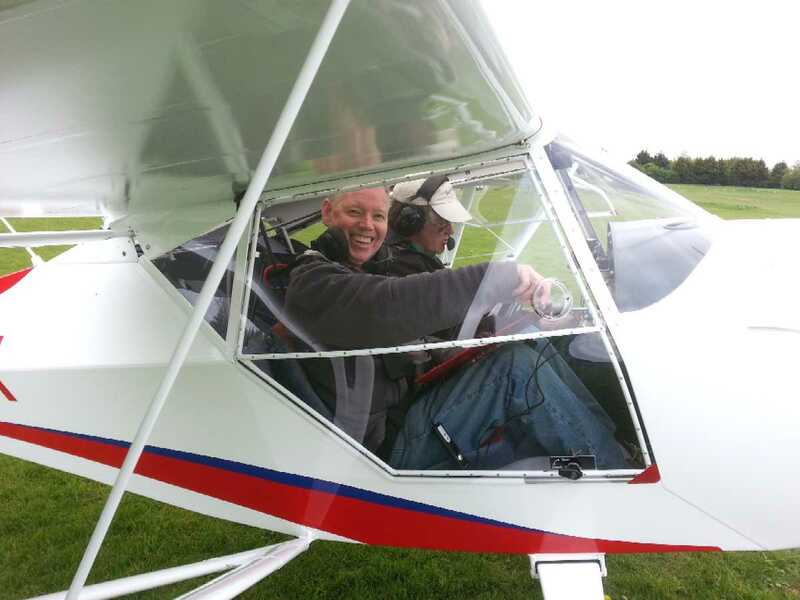 We arrange for a familiarisation demonstration for Mac (who runs the Microlight Aviation Club and Airbourne Aviation). He is the instructor who will be doing our taildragger conversion and difference training - this will be the next challenge for us all. We now just need to collate all the test reports and forms, send them to the BMAA and wait! Post Note: We thought that we didn't need a noise certificate as that testing on type had already been done. We were wrong - you still need to apply for the certificate, it just doesn't involve any actual testing (or fee). This held our application up a bit.